A cloud connection is one that is brokered by RealVNC’s cloud service. Cloud connections are extremely secure, convenient and reliable, but please that note both endpoints must be connected to the Internet. If you need to comply with a particular regulatory regime that disqualifies session data being routed via third party servers, you can disable relayed cloud connections. Note, however, this does mean these sessions will fail. 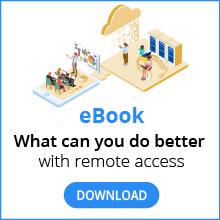 If you have a Home or Professional subscription, cloud is the only connectivity option. Sign in to VNC Server desk-side and follow the in-app instructions. Apply your license key and then follow these instructions. You can check whether cloud connectivity is enabled for a particular computer by seeing whether it appears on the Computers page of your RealVNC account. Cloud connectivity is disabled by default if you upgrade to VNC Connect from VNC 5.x. Follow these instructions to enable it.